When Clare and Andrew had their two children, they had the idea of combining this new chapter of their lives with their love of graphic and product design. 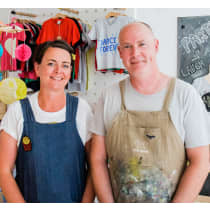 The result was Little Mashers, a creative children's boutique in Hastings. The shop stocks a range of vibrant kids' clothing - designed and printed in the shop studio - as well as beautiful books and gifts by local UK makers. "We wanted to make products for kids that are reflective of their natural curiosity and creativity. We are constantly developing new ideas that capture this fun spirit of childhood."